NAD Q Acoustic Q-NAD review | What Hi-Fi? Why combine two seemingly disparate brands in one strangely named system? Well, both NAD and QAcoustics are distributed by Armour in the UK, and someone came up with the bright idea of partnering NAD's mini CD receiver with the respected Q Acoustics 2010 speakers. And it looks quite a bargain. 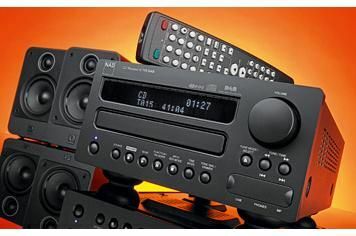 The NAD C715DAB CD receiver usually sells for £500, while the speakers are £110, but the package price is actually less expensive than the NAD alone, at just £440. In other words, you're saving £171, or 28 per cent. Of course, it also serves to give Armour a toehold in a sector of the market dominated by other brands. We're still not convinced about that name. Is it meant to summon up images of cruise liners? Anyway: what you get here is a compact all-in-one CD receiver with a 2x20W amplifier section DAB/FM RDS/AM tuner and drawer-loading CD player. Alongside that, it is packing a USB connection for MP3/WMA files on thumb-drives. There's no direct iPod capability, but the system has three analogue inputs to the rear, to which a suitable dock could be connected. Most systems of this kind have some sort of twist, and here it's that the USB socket not only allows playback of files from memory devices, but also lets you record from the system to such ‘sticks'. You can set the recording system and bitrate using a simple rolling menu which cycles through MP3 at 64kbps up to 192kbps, and WMA at WMA at 64kbps to 128kbps. You can then use that setting to record from CD, the internal tuners and external sources. It's useful should you want to copy radio programmes and the like. Which is all well and good. But the sound of this system overall leaves us a little nonplussed. We know the Q Acoustics speakers, and they have more to give than they show on the end of the C715. At low levels, things are smooth, relaxed and listenable enough, but up the pace and the volume setting and the NAD seems to be working a bit too hard to get the speakers going, and things get a shade ragged. Switching out the NAD for the Denon RCD-M38DAB CD receiver shows the 2010 speakers in a much more favourable light, and that's really our problem with this system. Yes, it offers a fine saving on the price of the NAD receiver and the speakers bought separately, but that only really serves to indicate that the C715 is rather pricier than it should be.